A little bit of a sleeper at times, imho. 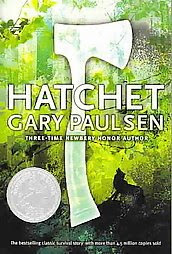 Hatchet is a story of lone survival in the wilderness. When a young boy off to visit his father in Northern Canada, is stranded off-course when the pilot of the small bush plane taking him there has a heart attack, he is forced to perform a crash landing. While the boy fashions himself a shelter and works on taking care of the necessary amenities of life, he starts to become a different person. With a new found appreciation of nature and beauty, a carefully learned patience and a dedicated persistence and drive, he notices the marked difference in his thoughts and feelings. Author Gary Paulsen infuses divorce and infidelity as part of the story line, and repeatedly has the boy, Brian, flashback to stressful images and thoughts related to his parents failed relationship. Although this inclusion seems slightly contrived and sometimes unnecessary, it’s interesting to note how the old Brian was eager to inform his father of ‘the secret,’ while the newly enlightened Brian decided better of it. Sounds like a younger version of Castaway. Yes, you could say that. It definitely had potential to be so much more than it was, in my mind.